Bounces tend to come with the territory when sending out mass emails. But an unusual problem with AOL’s bounce reporting methods was causing some JangoMail users to find their own email addresses on their campaign bounce lists. Due to the fact that the AOL message refers to the recipient by screen name (jquest14) rather than by the AOL user’s full email address (in the example above the AOL subscriber’s actual email address would be jquest14@aol.com), JangoMail’s bounce processor would occasionally pick up the only complete email address in the message: that of the sender. This error caused the bounce processor to relegate the JangoMail user to his or her own bounce list. To correct this problem, our bounce processor will now automatically add @aol.com to any screen name shown in an AOL MAILER-DAEMON delivery alert, and then send the AOL user to the campaign bounce list rather than the sender. JangoMail users taking advantage of our new SendTransactionalEmail API method can now filter their transactional emails by Subject, in addition to by Group ID, Group Name, Recipients, and the date when the email was Created. A drop-down menu allows users to choose from three Subject filtering options: starts with, ends with and contains. 1. Previously, in order to connect to an Excel database, the program required that the Excel document include a minimum of two rows of data. This issue has been resolved and the program can now accommodate Excel documents which include only a single row of data. 2. The drop-down menus where users select the type of database they wish to connect to JangoMail have been expanded to include Excel 2007 files (files ending in .xlsx) and Access 2007 files (files ending in .accdb). 3. Once a profile has been created in the Extract from Local Database utility and the user has indicated the type of database with which they wish to connect, they are prompted to hit the Connect button. In the past, with larger databases there was occasionally a lapse of several minutes between the moment when the user selected Connect and when the program completed the data upload. Now, thanks to an improved concatenation algorithm, the time required to upload even very large databases has been reduced to a few seconds. Inserting a "Forward-to-a-Friend" (FTF) link in your company newsletter and other e-marketing materials is a simple and cost-effective list-building technique that allows your email recipients to play an active role in your company's e-marketing efforts. In order to increase the odds of their customers using the FTF feature, one of our clients in Finland recently requested that we create a version of the FTF form in Finnish. The resulting form, which can be used by any JangoMail user with Finnish-speaking customers, can be accessed by inserting the new hyperlink (http://x.jango7.com/forward_fi.asp? ***uniqueid****) in place of the regular FTF hyperlink (http://x.jango7.com/forward.asp?***uniqueid****). Note that the link will only operate properly when it is sent as part of a JangoMail email message because only then will the ***uniqueid**** portion of the hyperlink be replaced by the recipient’s actual unique JangoMail identifier. In addition to Finnish, foreign language versions of the FTF page should soon be available in French and other commonly-requested foreign languages. If you feel that your company would benefit from having the FTF form translated into your local language, please contact us. We want to ensure that every JangoMail client is making optimal use of this powerful, list-building tool—no matter where they live or which language their customers speak. For years now, finding a way to keep email clients from blocking images in HTML emails has been the Holy Grail of email marketing. No matter which way you approached the problem, the result was nearly always the same: an annoying red x placeholder where your company logo or the picture of your hottest new product should have been, requiring the recipient to click on a link in order to view the images. JangoMail’s newest feature, block-resistant Embedded Images, will relegate most of those pesky little red x’s to the permanent recycle bin, and allow users to easily embed the content of HTML email images into their e-communications, thereby ensuring that those images are immediately visible to recipients when the email is opened―even when the email client is set to hide images by default! 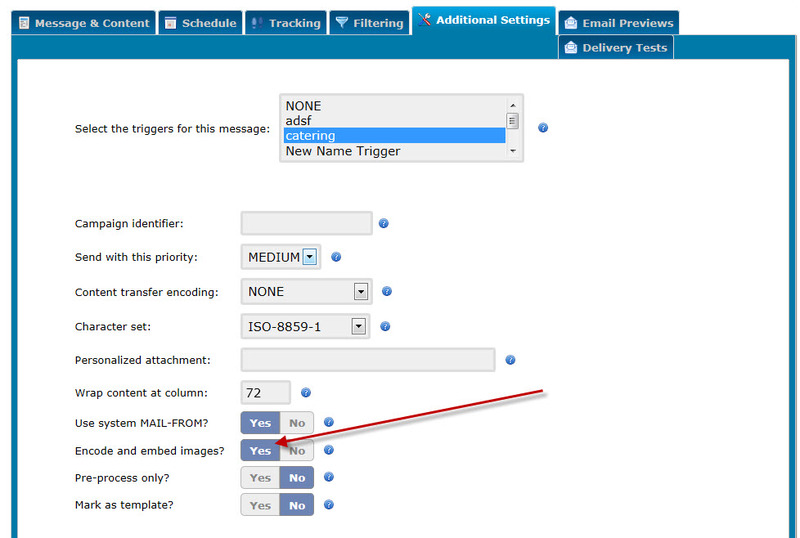 To bypass image blocking, go to the Send Email page and scroll down to the Advanced Options section. Checking the box next to the new “Embed Images” field will automatically convert the image references in your HTML email into encoded embedded images and ensure that your company logo and product images are instantly viewable by any recipient using a desktop email program (e.g. Outlook Express, Outlook, Windows Mail, Thunderbird) and by those using a Web-based email program such as Gmail. It’s that simple! Embedded Images do come with a couple of note-worthy caveats, though, including increased email size and additional bandwidth fees. Furthermore, open tracking data may be skewed, since open-tracking is often contingent upon a unique image being downloaded by the recipient’s email program. But, for email marketers eager to replace those ubiquitous red x place holders with their company logo or alluring images of their newest product offerings, the drawbacks of block-resistant embedded images are easily outweighed by their obvious advantages: improved brand recognition, the ability to view email images even if the recipient's computer is off-line, and noticeably higher response rates. 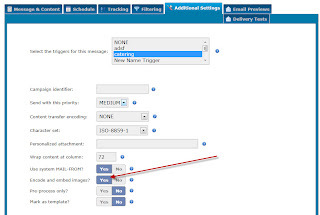 To send emails including embedded images using the API, call the SendMassEmail method and set EmbedImages to "True" or "False" using the Options input parameter.